Looks like we stumbled across iMeem at the same time. Been meaning to dig more into this myself. I played some tracks I found on the air there and I’ve got some chi town dudes sending their stuff my way. solid! Peep the Hotboy Smooth playlist posted in my last entry! Thanks for combing this one out! whattaya know? good meems spread quick! which looks more like the fluid breaking style of yore, kinda like popping and locking without the popping and not much locking either. Thanks, Rip. Hadn’t heard of Memphis Buckin. Love the way the i/my/you-net is letting these scenes rep inter/nationally. Also, though I was eager to share this stuff with the world, I realize that I’ve only cursorily contextualized it here. Don’t worry, though. I’ve got plans to talk to lots of people in the scene here and fill out the picture a bit (& support some of Chi-town’s unsung heroes). Act local, think global, knamean. 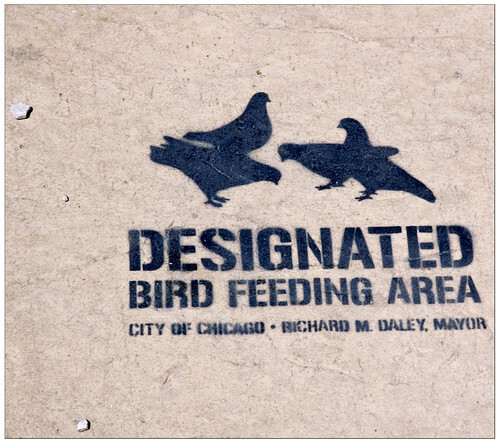 By the way, that “Designated bird feeding area” is inspired by an old work by Uk artist Banksy. Interesting point, Jorge. On the other hand, Banksy’s own referential work was no doubt inspired by more “official” signage. Hadn’t noticed the Zelda sound (it’s been a while), but I dug the Pacman refs! That obviously begs the question: what influence has video game music (and sound effects) had on regional urban genres, in the US and elsewhere? I don’t just mean stuff like “Do The Mario” by DJ Jubillee, Willie Puckett et al, but generally? It’s a good question, Birdseed. At least in one sense, it’s hardly surprising — these games made up an important part of the intimate and commonplace soundscapes for lots of (urban) kids growing up during the 80s and 90s. I’m not recalling a lot of examples at the moment, but hip-hop artists have been sampling (and imitating — via beatbox) video game sounds for some time now. I think this was Hosono’s own variety show (hence the comedy bits with the mad scientist- Hosono himself?- talking about communicating with nature). When the toms get hype-r around 1:10 min in, it could almost be juke! Didn’t Mad Kap (tragically under-rated!) sample the Mario theme to great effect in the early 90s? The “Space Invaders 2003” video up there is a trip. I’m not familiar with Mad Kap’s use of the Mario theme — though I agree that they’re underrated! — but I definitely think of Cocoa Brovaz’ “Super Brooklyn” as a notable/effective use of Mario samples. In addition to many other (early) instances, DJ Jazzy Jeff and the Fresh Prince (on the He’s the DJ album) have a song that features a number of Atari-era vid-game themes, but in that case, they’re reproduced by an impressive beatboxer rather than sampled.